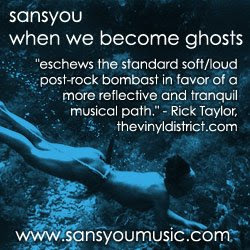 Your resource for all things shoegaze and dream pop: Interview: David Nicholas of Sansyou. When The Sun Hits Interviews David of Sansyou. 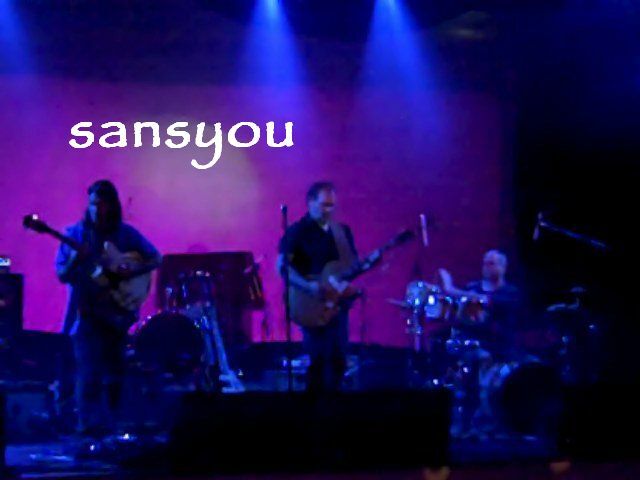 Sansyou is comprised of the duo David Nicholas (guitar) and Matt McGarraghy (guitar, piano, percussion), with Davis White lending his percussion talents for live performances. 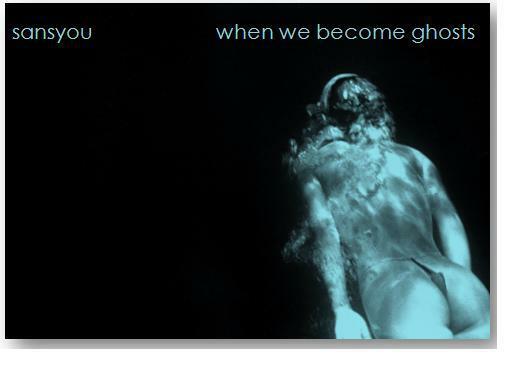 The band's recently released EP, When We Become Ghosts, has been a blog favorite since its release in September 2011, so we were understandably thrilled to get a chance to interview David Nicholas. 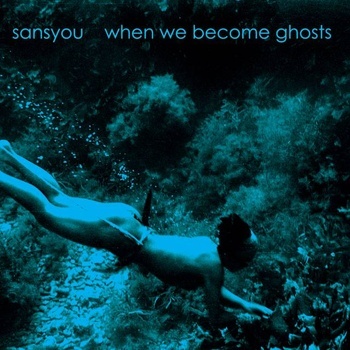 When We Become Ghosts was recorded in a mere two days, but that 48 hours easily managed to capture the expansive and introspective sound of Sansyou. By weaving atmospheric guitar textures into songcycles and tonepoems, the band creates soundscapes that invite deep dives to inner-space. Sansyou has performed in Washington DC since 2006 under acoustic-oriented lineups before establishing their current electric sound. In 2010, Sansyou made a stand for scientific literacy, performing at the State Theatre Fundraiser in Falls Church, VA to save the Arlington Planetarium. Sansyou takes much inspiration, and their name, from Japanese culture. This sensibility is reflected in the artwork for When We Become Ghosts, featuring ethnologist Fosco Maraini’s photographs of pearl divers in Honshu, Japan (1962). Responding to the disasters in April 2011, Sansyou curated a fundraiser performance at the Marx Café to benefit Red Cross Japan. When We Become Ghosts is poised to be at the top of our list as one of the best EPs of 2011 and we can't wait to see what Sansyou does next. Enjoy getting to know guitarist David Nicholas in the following interview, and keep your eyes and ears on this band! David: We started playing in 2006 with different lineups and kept the instrumentation to acoustics only. We played some shows in the DC area with that configuration and it gave me a chance to understand what is possible with instrumental music and how to make space for cello as an implied vocalist. In 2010, I really wanted to plug back in and work with different sounds so Matt re-entered the equation after playing with us in earlier versions of Sansyou and we started working as a trio; two guitars and hand percussion and continue with that now that Davis White has joined on percussion. Lots of people think Sansyou is a French term, “without you”, but it actually is a loose translation of the Japanese word for giant salamander. It’s an endangered animal, native to Japan that I’ve always been fascinated with, and always had an ongoing interest in Japanese culture and creative arts. The name sounded nice phonetically so it stuck. Can you tell us what Sansyou has been working on and what you've got forthcoming in the near future (new releases, tour, etc)? David: We’re excited to play as many shows as we can now that we have our EP out, When We Become Ghosts, starting with a release show at Galaxy Hut in Arlington VA on November 7. We have some new songs that we’ll feature too for that show and I’m looking forward to playing those. With Davis on percussion, we’re exploring some really different sounds. It’s good to keep evolving and growing; it challenges me to re-examine my playing. David: People who appreciate those genres do seem to connect with what we do so there must be something to it. We use the textures of overlapping echoes for the two guitar parts as much as we choose chord changes that weave together and that probably associates our sound in those genres. 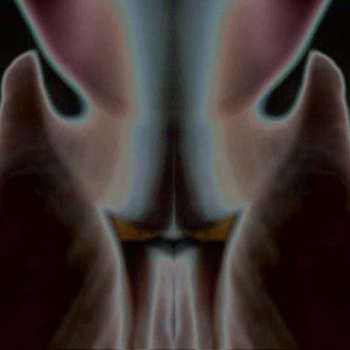 At the same time, I hear elements of our music that are more minimalistic and we do come from an acoustic foundation so that sets it apart I think. Labels and genres can be confining when you think about your own music, but I see the need for them to just have some way of organizing and filtering the ocean of music out there but the interesting stuff to me always blurs the lines too. David: We are definitely lucky to have played with Screen Vinyl Image at a fundraiser show and always enjoy seeing them play. They have that rare match of great songs and great performance energy. There are some great variations on the genre happening now. I really like the new Hammock cd. Often I’ll listen to things with no guitar too; like Lost Civilizations, an improvisational combo that uses saxophone and bass cello and other elements. It can reset my ears in a good way. David: Mostly a 1950s Gibson ES-295. The resonance and overtones it generates just unplugged really come through that much more when amplified. I have to give Geordie from Killing Joke due credit for getting me interested in this model. The big hollowbody really becomes a drum in itself. For amps, I like to work with Billy Penn at 300guitars.com to design a circuit and select the components that give me optimal headroom and clarity. He’s built two amps for me that really let the guitars shine through with the different delays and reverbs I use. Matt uses an Agile AS-820 as well as a recently acquired Ibanez AS-73. He plays through a Schreyer Sage-7 amp and uses an array of delay, chorus, and reverb pedals. David: This is where I consciously put myself in the hands of a professional. Matt did pre-production recording with his Mac which was good preparation. When we were ready, we recorded at Asparagus Media Studios in Takoma Park, Maryland with Steve Steckler and that enabled me to focus on getting the sounds together and then making mixing decisions immediately afterwards. The whole recording was recorded and mixed in two days so I had to limit myself to what I really know how to do best. I would definitely recommend taking the time to have any recording you care about carefully mastered. Taylor Deupree at 12k mastering works in analog, and I’ve been a big fan of his work and other artists on the 12k label. He really brought out the detail and clarity in each song without abusing compression like so many other recordings I hear today. David: There’s more of it, that’s for sure. I can sympathize with touring bands and artists that are trying to sustain themselves strictly through selling music because that’s gotten harder to do. So the accessibility and portability of music can be positive but it also seems to promote an attitude of disposability and entitlement that it should be free in all forms. I’ve never gotten comfortable with that idea unless the artist wishes to give it away. David: We’ve had success with bandcamp and before we went into the studio I made a few inquiries with labels but the amount of control that you hand over just isn’t worth it. When the means of production are readily at hand, I just didn’t see the point. For others, the situation may be different. There are benefits to what a label can do with distribution but for what Sansyou is doing and the people who want to hear it, I think we’re on the right path. David: I grew up with vinyl and still love that tactile experience of connecting with the music in a very physical way…the packaging, the opportunities to expand the artwork, the sequencing of the 2 sides. I looked into releasing When We Become Ghosts on vinyl and I think the pacing of the songs has an implied beginning, middle and end that would have worked well in that format, but the cost was prohibitive. It became a choice of quality control too because I didn’t want to trust it with a substandard pressing. Maybe that’s where a label could have helped shoulder some of the cost, but releasing it on cd meant it could be done on our timetable, and would not see the light of day until we were satisfied with every aspect, from the audio quality to the packaging. I’m certainly not averse to exploring vinyl releases in the future. David: I’m sure all the music I’ve listened to in every genre comes out at some point in Sansyou. It has to doesn’t it? Certainly Robin Guthrie comes through and I really love what David Grubbs does on his solo work. Sam Prekopp and Archer Prewitt definitely have an economical phrasing that I love. And sometimes the influence of others shows up but not in the sound necessarily. The work of Chris Haskett in the Rollins Band and Geordie Walker in Killing Joke are inspiring from what I feel in their playing and how innovative they are – really original voices on guitar. The intensity of their sound is inspirational even when playing softer music like we do. Geordie gave me a piece of advice in 1989 when I asked him how he comes up with his sound. He said, “play what you want to hear.” Easier said than done, and it never left my mind. David: One artist that had a direct influence on us is Chet Zar. I had a print of one of his paintings titled “Black Nerve Administrator”. Matt and I were writing one day and I said, let’s look at this print for 30 seconds and then write a song. We did and that’s how that song developed on the spot I asked Chet if we could use the title for it and he graciously agreed. His paintings find a way to blend the frightening with the sad and tragic all at the same time. I like that. I’m usually reading non-fiction in the anthropology/history area. Jared Diamond and Mark Kurlansky have yet to let me down. They see the trends that ultimately become truths and futures. If you had to choose one Sansyou track that was the ultimate definition of your sound, which would it be and why? David: Hopefully that work is still in front of us. There’s one we’re writing now called “Sunflower” that I’m pretty excited about. If I had to choose one from When We Become Ghosts, it would be the title track because it covers so much territory in one song. Matt came up with great piano and percussion parts on it that imply a bassline and add so much to the piece. It was a great experience watching and listening to that one as it was recorded. David: It tends to be pretty intuitive. One of us will start a chord progression and we just develop it from there. The guitars seem to find a way to intersect with each other on their own. We are aware of covering space that leaves room for the other, so we rarely stack up in unison. Another part of our sound is that sometimes Matt will play in an altered tuning and I’m in standard, or vice versa. There’s a natural resonance that starts to happen with that too sometimes. Almost like a third element in the room or an implied bassline will emerge. David: Good question. Honestly, I just try to live with intention and integrity.